I do love panko breadcrumbs. The ridiculous extra crunch the Japanese breadcrumbs give is so satisfying. So I was really looking forward to chicken coated in panko when I got home. Until I realised I didn’t have any eggs. The typical pane station is flour, egg, breadcrumb. But with no eggs what was I going to do? I figure all it needed was something for the breadcrumbs to stick to. 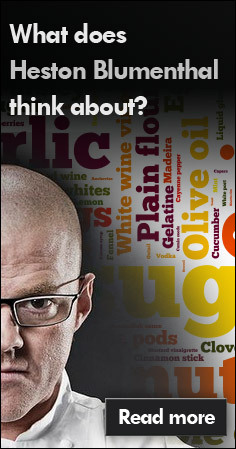 So why not the chef’s friend cornflour? My only problem was avoiding that gluey taste that cornflour can give, so I added some ground spices to mask the flavour. Seemed to work pretty well. To the point in fact where I don’t see the need to waste an egg on breadcrumbing again! 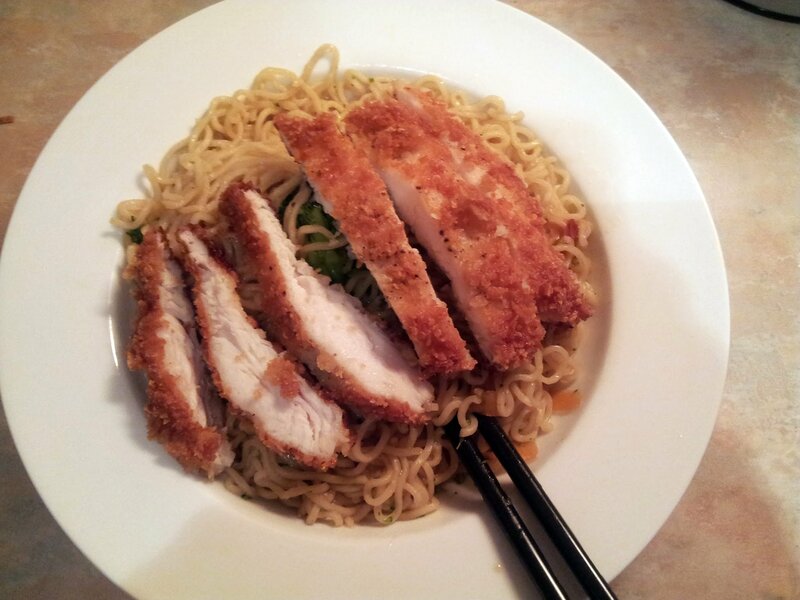 This is an easy to rustle-up, easy to multiply dinner that is a great combo of crunchy chicken and slurpy noodles. You could use any sauce you like with the noodles – even a splash of soy would do. Get a large pan with shallow oil over a medium heat, and a saucepan for your noodles over a high heat. Lay out a sheet of cling film and dust with salt and pepper. Put the chicken on this and lay another piece of chicken on top. Using a rolling pin, bash the chicken to approx 1cm thin. In a bowl combine the cornflour, cumin and coriander. Add milk until you get a thick, sludgy paste. Set up a breading station, with one bowl of plain flour, your cornflour sludge, and the breadcrumbs. Dust the chicken with flour, dip in the cornflour paste and then in the breadcrumbs. Make sure they are well coated. Lower the chicken into the oil gently. When done on one side flip over until done, then drain on kitchen paper. Get the chicken stock on to boil in the saucepan and add the noodles. After 3 minutes or when the noodles are done, drain them and rinse well with cold water. Add the broccoli back to the noodle saucepan, add the chilli along with a splash of water. Peel the carrot and use the peeler to shave into strips into the broccoli. Jam the lid on and cook fast. After about 3 minutes the broccoli should be tender, so add the oyster sauce and toss well. Cook for a further minute and then add the noodles back to the pan, tossing well to mix. Serve in a bowl topped with sesame seeds, and top with the sliced chicken. 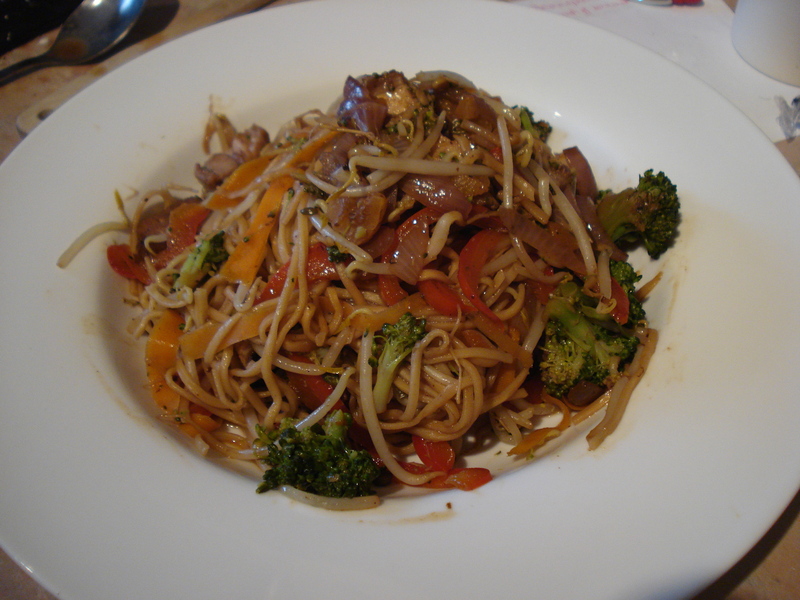 This entry was posted in breadcrumbs, broccoli, chicken, coriander, cumin, food, noodles, oyster sauce on April 18, 2013 by Gary. 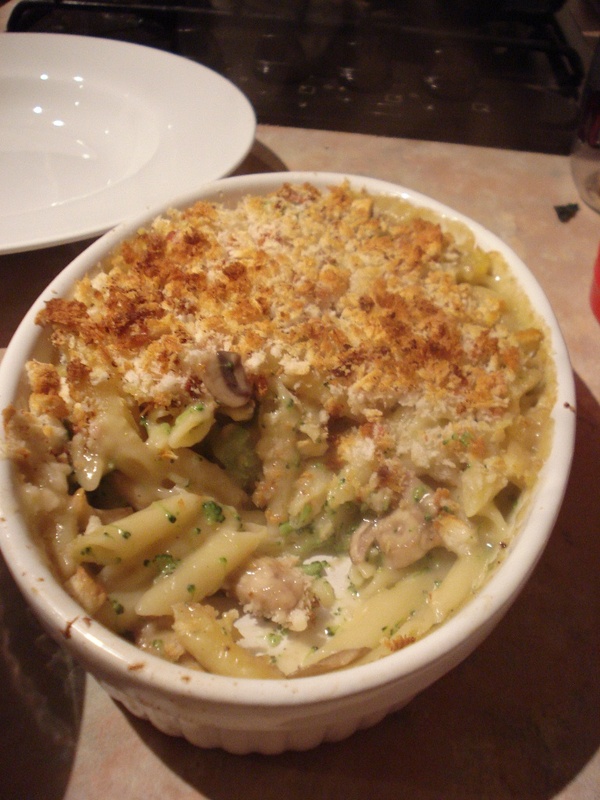 Continuing my series on decent grub on a budget, here’s a pasta bake dish with lots going on. It’s the breadcrumb topping that makes it! This was intended to have a white sauce made with milk but I ran out, so instead I went for a velouté version made with stock. (PS. I’ve listed ingredients for 1 but the version above serves 2 – 3, in case you’re wondering why yours is smaller!). Get a large pan of salted water on to boil over a high heat and preheat the oven to 200°C. Get a smaller pan on a medium heat and get a baking dish ready. Add the pasta to the water. Add the butter to the smaller pan and once melted whisk in the flour to combine to a gloopy paste. Crush in the garlic and allow it to cook for a couple of minutes. Add all the stock, whisking all the time. Add the mushrooms and veg to the pasta water and then return to whisking your sauce. Keep whisking until it resembles thick, smooth custard. At this point you should check to see whether the sauce needs salt or pepper. After the vegetables have cooked for five minutes drain these along with the pasta and combine with the sauce in your baking dish. If you have a food processor blitz the torn-up bread and bacon together to breadcrumbs, if not lay both on a chopping board and rock your knife over the lot of it to dice as small as possible. Scatter these breadcrumbs in a single layer over the pasta bake, and pop in the oven for about 15 mins until the breadcrumbs are golden and the bacon pieces are cooked. This entry was posted in bacon, bread, breadcrumbs, broccoli, food, garlic, mushroom on October 7, 2012 by Gary. This is a hefty Sunday lunch in disguise. There’s quite a lot going on here so you have to plan ahead but by golly it’s worth it. There’s quite a few pans to have on the go too. The pomegranate juice makes it – sticky and sweet. That with juicy belly pork, crunchy veg and tasty noodles, this is a really interesting plateful with every mouthful slightly different. This recipe is from Alex Mackay’s Everybody, Everyday . The recipe makes enough for 4 with pork, onions and juice left over so keep that in mind! I reheated mine with some wet polenta which works really well. You can see other recipes from this book that I’ve cooked here. Preheat the oven 160°C. Score the pork belly with a sharp knife and rub all over with salt. Get a thick-bottomed roasting tray on a high hob and get a little oil really hot. Add the pork skin side down. Turn the heat down and fry for 10 minutes. One the crackling looks golden add the onion halves, flip the pork over and put it on top of the onions. Transfer to the oven. Roast for 25 minutes. While the pork roasts, bring the soy sauce, pomegranate juice and stock together in a saucepan to the boil. Reduce by two-thirds and whisk in the cornflour, add the rosemary and apricots and turn off the heat. When the pork reaches 65°, remove from the oven to rest. Slice thickly and use reserve half for another recipe. Put the onions to one side and use half of these in another recipe. Take a lidded saucepan and put it over a high heat. Trim your broccoli into florets and halve each one so they have a flat side (this will catch and create a lovely toasted flavour). Add the florets to the pan for abut 3 mins, then add the garlic, a sprinkle of salt, a splash of water and jam the lid on. After another 3 mins shake vigorously until tender, and then put to one side until you’re ready to stir fry. Get your largest wok out over a high heat. Add a dash of oil and fry the red pepper for a couple of minutes. Add the beansprouts and cook for a further minute, add the pork, 5 or 6 onion halves, broccoli and use a peeler to shave in the carrot in thin strips. Keep it moving as much as you can, and add about 200ml of the sauce from earlier. Toss in the noodles and keep stirring. When everything gets up to temperature sprinkle over some chilli flakes and serve. Eat immediately. This entry was posted in beansprouts, broccoli, food, noodles, onion, peppers, pomegranate, pork, red onion on August 22, 2012 by Gary. This is one that swilled around my head for a while until coming together. 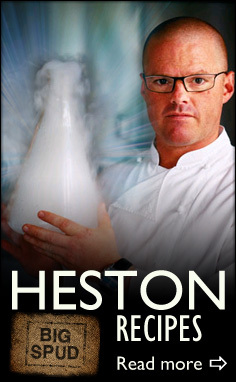 It’s a hybrid of ideas from a recent appearance of Theo Randall on Saturday Kitchen and a Jamie Oliver 30 minute meal. The most satisfying part of this is using the part of the broccoli you usually throw away, the stalk. Whizzed up and fried it’s as tasty as it’s flowery florets. Mixed with sausage and cream it’s almost rich. Whouda thunk it, broccoli being rich?! Make sure you’re generous with the chilli to balance it all out. While I ate it I thought pine nuts would be great with this – must try it next time. Heat a little oil in a pan and add the bacon. Get a large pot of water on to boil. In a food processor blitz the broccoli to crumbs with the anchovy. Drop in the sausages and add a trickle of olive oil to make a paste. Add the paste to the bacon in the pan and stir fry for a few minutes. Crush in the garlic and get the pasta on to boil. After the pasta has cooked for about 5 minutes, add the broccoli florets and cook for 5 minutes more. Turn the heat down low and add the cream and parmesan, stirring well to combine. Add the drained pasta and broccoli and if necessary let it down with a little of the pasta water. When mixed nicely and all slick and creamy, check seasoning and serve with more parmesan. 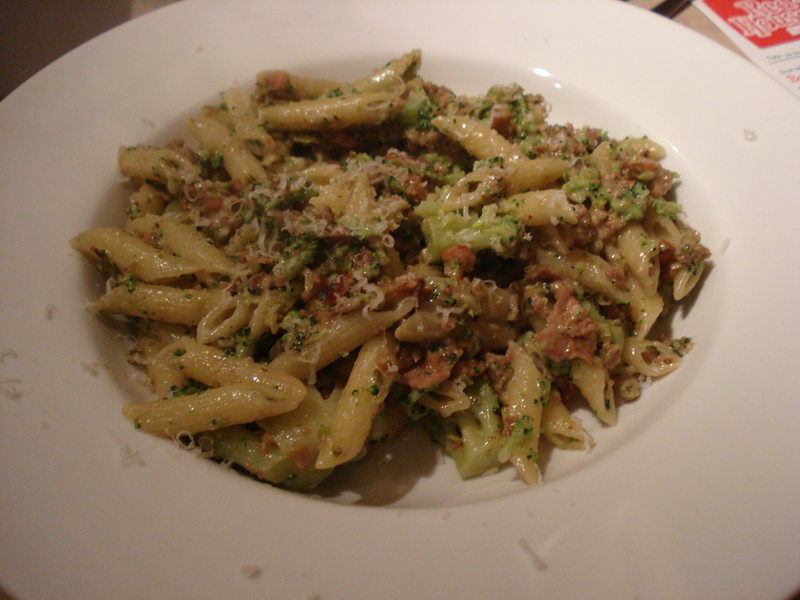 This entry was posted in bacon, broccoli, cream, fennel, food, parmesan, sausages and tagged jamie oliver, theo randall on December 4, 2011 by Gary. 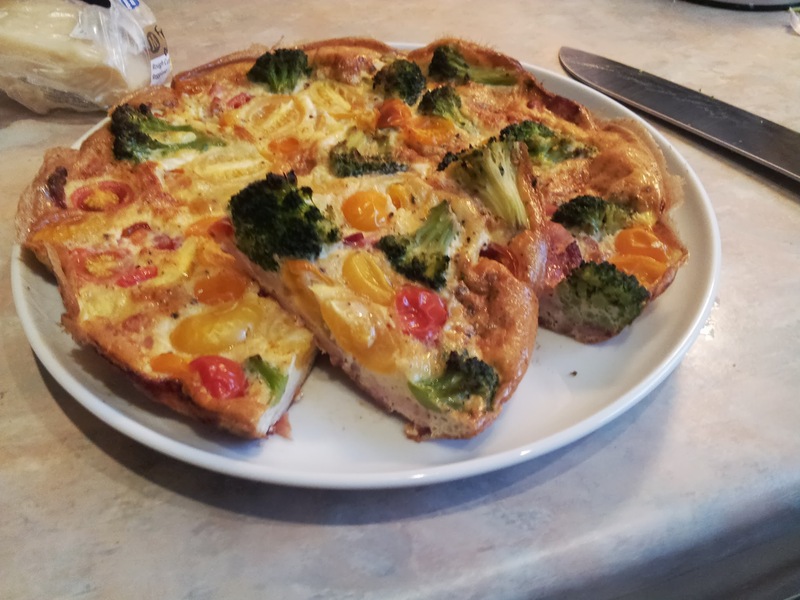 I’ve written this post as a guest over at Jo’s Kitchen. Go on, go have a look! This entry was posted in broccoli, cauliflower, food, orange on June 25, 2010 by Gary. 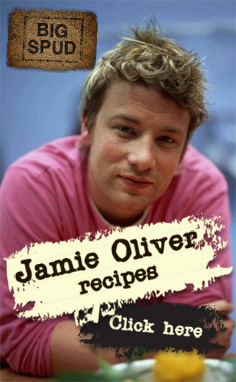 Jamie Oliver’s title, not mine. Yes it’s another recreation from Jamie’s America . I have a macaroni cheese recipe I’m pretty happy with so it would be interesting to see what this brought to it. You start with a roux, add sliced garlic, whisk in milk, add cheese and then add boiled pasta and tomatoes. For some reason tomatoes weren’t on the menu tonight so I bunged in broc and cauli instead. Breadcrumbs on top, then in the oven for half an hour. The key differences to mine were to add sliced garlic to the roux. This did lend an interesting smoky note to it which I enjoyed, but I didn’t feel adding both cheddar and parmesan did much for it. If I was going to improve on it, some pancetta would be nice and chewy. This is still a work in progress. This entry was posted in broccoli, cauliflower, cheese, food, garlic, pasta, roux and tagged jamie oliver on October 9, 2009 by Gary.